I suspect every one of us thinks that we have an almost encyclopaedic knowledge of our epics. Having been weaned on a healthy junk-food diet of Amar Chitra Katha, Ramanand Sagar and BR Chopra, ita��s quite normal to exude the cocky demeanour of a Kapil Sibal every time one is posed a question on Indian mythology. hed very many things that no one had told me before. 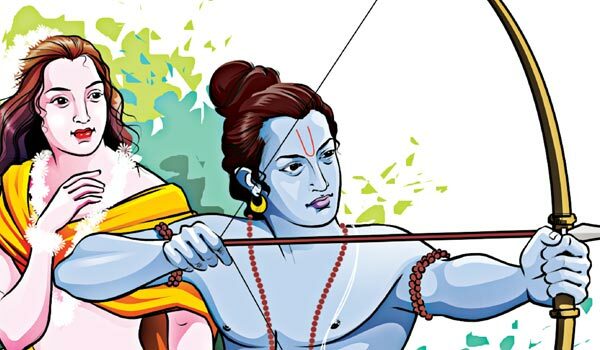 Rama, as it turns out, has many meanings. a�?Harbinger of happinessa�� is the one many latch on to. But it also cues a�?dark complexioneda��, which is probably why he is depicted blue in the comic strips. Incidentally, Krishna is also synonymous with a�?duskya�� skin. So all you a�?fair and lovelya�� folks, ita��s time you gave us sooty beauties more respect. Sita is the a�?trench made in the land while ploughinga�� and it seems she emerged from a furrow when her dad Janaka was tilling his farm. Some of you might have already known that. But I am not sure if you know how Surpanaka got her name. It seems her nails resembled the winnowing fan at birth. Thata��s how! did you know Karna is literally the a�?eara��? The story goes that Kunti gave birth to her first son through her ear to avoid losing her virginity. Maybe thata��s how we got the expression a�?playing it by the eara��. To just complete the dots in your head, Kumbhakarna, by the same logic, means a�?pot-eareda��. The ever-scheming Shakuni is curiously named after the hen sparrow. Now you can get your head around the bizarre band name a�?Shakuni & the Birds of Preya��. Continuing on skin tones, Arjuna is supposed to be a�?white and cleara�� or as some say a�?silvera��. And Pandu, a�?pale yellowa��. Talking of Pandavas, Yudishtra is a�?firm in battlea��, Bheem is predictably a�?formidablea��, Sahadeva is a�?like the godsa�� and Nakula means a�?mongoosea�� apart from the politically correct explanation a�?handsome in the lineagea��. By the way, the real zingers are Kamsa (a�?cupa��), Vyasa (a�?diameter of a circlea��), Ashvathama (a�?horse powera��), and Kubera (a�?deformed onea��). The most surprising interpretation I came across involved Kashyapa. It seems the word meant a�?black teetha��. That scrap of trivia made me want to brush up my folklore all over again.